Pethub has announced its acquisition of GetPetsHome so that it can provide free digital ID tags. A startup from Seattle called PetHub, has just announced that this QR codes product company has acquired another business called GetPetsHome, which is based in Atlanta. This has not only provided them with the business, but also the domain name and user list. With the acquisition of GetPetsHome, PetHub has managed to take in its domain name for its website, and has absorbed that company’s user list into its own. The three employees from the acquired company – which also made ID tags for pets that featured QR codes – will not be adding their numbers to the PetHub family. 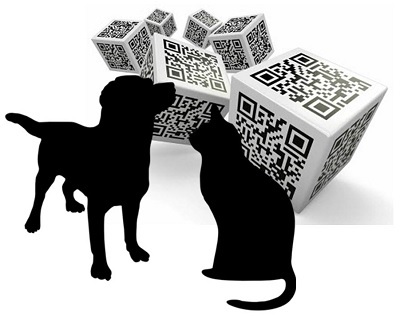 These QR codes on pet ID tags help to make it easier for a lost pet to find his or her way home. The users of the GetPetsHome service will be receiving an email advising them of what has happened and that they can redeem free ID tags through PetHub through the use of an electronic voucher that they will receive within that message. Their previous tags from the acquired business will be expiring by the closing of March. The pet tags are beneficial because they feature not only the animal’s name, but they also include a QRcode that, when scanned by a smartphone or tablet using a free reader mobile app, can provide several contact numbers for the owners, as well as that animal’s health data. This can include medical conditions, medications it is taking, and special nutrition requirements. Owners simply create their accounts on the PetHub platform to add the information that they want to share with someone who has found their lost pet. That account can then alert them when their pet has been located after having gone missing. According to the American Human Association’s data, one in every three animals (cats or dogs) will go missing at some point in their lifetimes. Even when an animal has been rescued and brought to a shelter, only 25 percent of them will make it back to their original families. Half of those surrendered to a shelter will never leave that place. This helps to show how important it is for a pet to wear a clearly labeled, high quality ID tag at all time. The more information someone receives about the pet when it has been found – such as by scanning QR codes – the better the chances of having that animal returned.